Since they were first identified, the huge Baby Boomer and Millennial cohorts have fascinated demographers and sociologists. As they moved through their lifestages, these two groups influenced life in the US; however, over the years, Generation X (GenXers) was stuck in the middle and largely ignored. So, who are the GenXers? According to Pew Research, GenXers are stuck in the middle of everything. Demographically, they’re between the ages of 34 to 49; not old, but not young. Pew also notes that they are more racially and ethnically diverse than Boomers (61 to 72 percent), but less diverse than Millennials (57 to 61 percent). Generation X households are scattered across the US. Some counties in the Greater Denver metro area count GenXers as more than 12% of the total population. Many GenXers also live in Clark County, Nevada (14% of 2,083,955 people) and Lexington County, South Carolina (14% of 278,599 people). However, only 7% of the 47,255 people in Whitman County, Washington are GenXers. This map shows where you can find GenXers by county in the US. View the interactive map. Based on their ages, approximately 65 million people could fit into the Generation X category. Paul Taylor and George Gao of Pew Research cite two possible reasons for this group’s lower numbers: relatively low fertility rates, and a smaller generational span—16 years versus 20 years for Boomers and Millennials. However, research from Neil Howe calculates that Generation X spans 20 years, from 1961 to 1981, and numbers approximately 84 million. Political scientist Jon Miller, University of Michigan, author of The Generation X Report, notes that members of Generation X are the parents of today’s school age children in the US. GenXers will be elected to Congress and the Presidency during the next two or three decades. Pew Research states that GenXers are more pessimistic about their retirement than Boomers and Millennials. Although GenXers may earn more than their parents, they have much less wealth and are carrying six times the amount of debt. As noted in a Forbes article by Erik Carter, GenXers suffered the most from the economic downturn. They invested heavily just before the housing and stock markets peaked. These declines came just as they incurred more expenses, such as assuming mortgages and raising children. The Great Recession hit them the hardest—they bought their houses at the top of the bubble; home value for many is probably still underwater. Many Boomers who were adversely impacted by the Great Recession kept working, preventing GenXers from replacing them and advancing their own careers. Wealth acquisition slowed just when they needed it the most. According to Gerlinda Grimes in HowStuffWorks, when they were little, GenXers were unfettered by seatbelts, and as the first latchkey generation, they roamed their neighborhoods on bikes. They can brag about being the first gamers, the first generation to watch cable TV, and the first members of the MTV generation. GenXers are geeks; they developed YouTube, Amazon.com, and Google. Famous GenXers include actors Julia Roberts, Brad Pitt, and Will Smith; athletes Tiger Woods and David Beckham; and entrepreneur Jeff Bezos. WiseGeek says that many GenXers grew up watching and listening to Bon Jovi and Prince on their VCRs and personal cassette players and remember when the microwave was a big deal. Robert Tanner of Management is a Journey says GenXers’ core values are diversity, self-reliance, practicality, informality, work/life balance, flexibility, and technology. He lists significant influencing events such as high parental divorce rates, the fall of the Berlin wall, the energy crisis, the Watergate scandal, corporate layoffs, the Rodney King beating, and the explosion of the space shuttle Challenger. Again stuck in the middle, Generation X ranks high for being part of the “sandwich generation”—caring for parents while raising children. According to a nationwide survey conducted by Pew Research, 47 percent of adults in their 40s and 50s have a parent age 65 or older and may also be raising a young child or financially supporting an adult child age 18 years or older. These financial obligations have increased when their adult children couldn’t find a job after the Great Recession. Both men and women might be members of this “Sandwich Generation”. Hispanics, blacks, and affluent adults are more likely to be in this situation than whites. Even though time management is said to be stressful for these folks, the survey found those caught in the Sandwich Generation were just as happy overall as others who are not in this situation. Age data for this article comes from Esri’s US Updated Demographics, judged the industry’s most accurate data in a blind, independent study conducted in 2011. 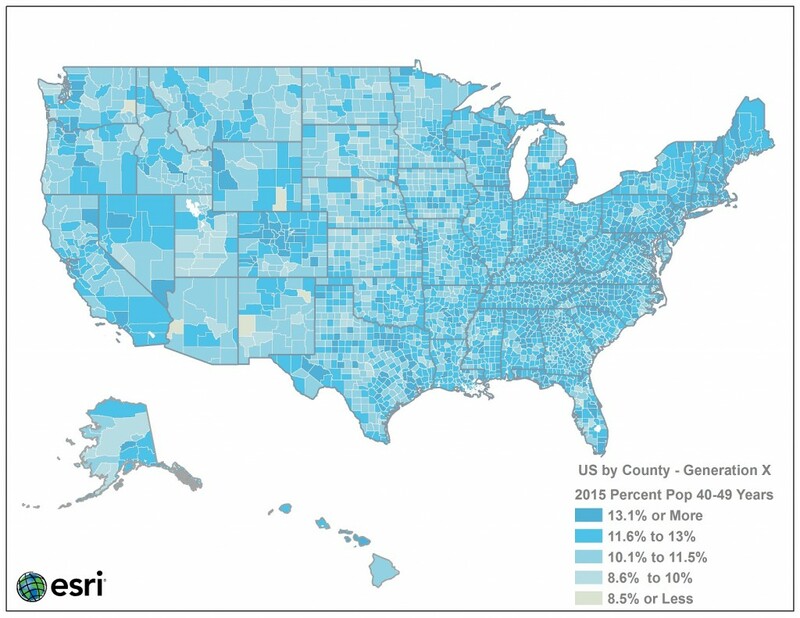 Demographic data for the US and more than 130 countries is included in ArcGIS Content and can be accessed in a variety of ways.